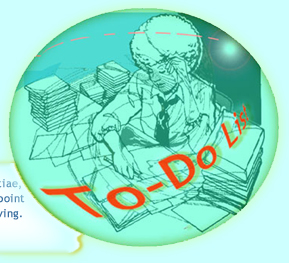 QUIRKYBLOG: Your window into the world of To-Do List. Hark! There will be a QUIRKYALONE BIKE TOUR in the South of France in September 2006. For more information, visit quirkyalone.net. I'm super excited to announce that To-Do List will now be a book! 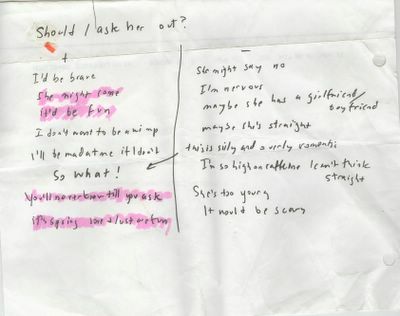 TO-DO LIST will be published by Simon & Schuster in fall 2007. For more information about how to contribute lists to the book, please visit todolistblog.com. TO-DO LIST will be a book of real, handwritten to-do lists with commentary. It will capture the range of mundane and meaningful things we think about in our everyday lives. I invite you to contribute your lists--ideally, the real, handwritten variety written in the course of your everyday life. We’re interpreting "to-do" broadly: everything from garden-variety daily to-do lists to . . . Deadline: July 1, 2006, but the sooner the better. Tech-savvy? Feel free to send a scan of your list too to todolistblog at gmail dot com. But eventually I will need the real thing. Please include: Your name, mailing address, email address and phone number. Feel free to include a short note about what was going on in your life when you wrote the list; what prompted you to write it; what does the list mean to you; how do you the feel about the person who you were when you wrote it. Two or three sentences is fine. If your list is chosen, I will contact you to interview you about the story behind the list—in other words, what was going on in your life when you wrote it. Your contribution can be anonymous in the published book, so don't hesitate to send in lists with revealing items—those are often the best kind. To-Do List is still on hiatus but now I am collecting to-do lists for a book project. I want your lists, all of your them: to-do lists, desert island lists, top 10 lists, 10 things to do before I die, pet names for lovers lists, and so on. Please note that I want your authentic lists, nothing that you write specifically for publication. You can always tell the difference between the carefully composed list and the real thing. I will post some of the best of the best on a website in advance of the book's publication and in the book itself. Mail your lists to To-Do List Book, PO Box 40128, San Francisco, CA 94140. Be sure to include the following release with the requested information: name, mailing address, phone and email address. If you have the ability, please send a scan at 300 dpi of your list to [email protected] The scan is very helpful and appreciated but cannot substitute for the genuine article. Either way I need your real list in the mail. You can send in the list alone. You are also welcome to write a handwritten few lines (or typed if necessary) about your state of mind when you wrote the list, and any other story that goes along with the list. Let me know if you prefer to be anonymous or if it’s okay to list your name, age, occupation, and location with the list. By submitting a list, I grant To-Do List a perpetual, royalty-free license to use, reproduce, modify, publish, distribute, and otherwise exercise all copyright and publicity rights with respect to that list at its sole discretion, including storing it on To-Do List servers and incorporating it in other works in any media now known or later developed, including, without limitation, a website and published books. If I do not wish to grant To-Do List these rights, it is suggested that I do not submit information to this project. To-Do List reserves the right to select, edit and arrange submissions, and to remove information from the To-Do List book and website at any time at its sole discretion. Sign up to receive periodic quirkyalone-relevant tidbits by email! Get the latest on International Quirkyalone Day parties, quirkyalone resources and, of course, the book itself. International Quirkyalone Day: A celebration of romance, uniqueness, friendship, and the power of one. Learn more here.